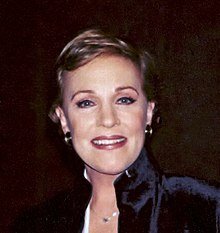 Dame Julie Elizabeth Andrews (born 1 October 1935) is a British movie and stage actress, singer, theatre director, dancer, and writer. She was born in Walton-on-Thames, Surrey. Andrews was a child actress and singer. She appeared on the West End in 1948. She made her Broadway debut in The Boy Friend in 1954. She starred in the stage musicals My Fair Lady and Camelot with real success. In 1957, she appeared on television in the musical Cinderella. Andrews made her movie debut in Mary Poppins in 1964. She won the Academy Award for Best Actress for this performance. She appeared in The Sound of Music in 1965. Between 1964 and 1967, Andrews appeared in The Americanization of Emily, Hawaii, Torn Curtain, and Thoroughly Modern Millie. In the 1970s, Andrews had a few commercial disappointments before appearing successfully in 10 (1979) and Victor/Victoria (1982). Her career sagged in the 1990s. Her voice was damaged by a throat operation in 1997. Andrews appeared successfully in dramatic roles in The Princess Diaries in 2001, and its sequel The Princess Diaries 2: Royal Engagement in 2004. She had voice roles in the Shrek animated movies. In 2003 and again in 2005, Andrews directed revivals of her first Broadway hit, The Boy Friend, in New York and Connecticut. Andrews has also written children's books. In 2008, she published her autobiography, Home: A Memoir of My Early Years. Andrews has received many awards during her career including an Academy Award, Emmy Award, Golden Globe Award, Grammy Award, BAFTA, People's Choice Award, Theatre World Award, and Screen Actors Guild honors. In 2000, she was made a Dame Commander of the Order of the British Empire (DBE) by Elizabeth II for services to the performing arts. ↑ "Dame Julie: The sound of music". BBC. 31 December 1999. Retrieved 29 January 2007. This page was last changed on 23 February 2019, at 17:39.